At Rockville we understand you have a choice of where to buy your pro audio gear. We strive to compete in quality with higher end brands in the market. We also market directly to end users cutting out all middlemen which is why we are able to offer high end products at lower prices than the cheap stuff out there. Something we like to do is to explain the differences between this and off brand pro audio subwoofers so you can understand how great the quality of this subwoofer is. The cheaper ones use particle board. We spend more money manufacturing these with MDF which will hold up for a much longer time than particle board. We are using a real true pro audio subwoofer in the cabinet which has very large 3" voice coils and a 90 oz magnet. The off brand names use a magnet half the size of this and a smaller size voice coil. The advantage is that our unit can handle more power and will last longer. These subs can take a real beating! The other difference is the build quality. We go the extra mile to use the right amount of glue, solder, etc. Lots of off brand name subs blow due to poor glue or poor solder. Lastly, our company goes through vigorous testing for sound quality and tuning before we start our mass production. Lastly, we have one of our very own technicians go to the factory and inspect a minimum of 15% of the production models to ensure the quality is as good as the original samples we engineered. 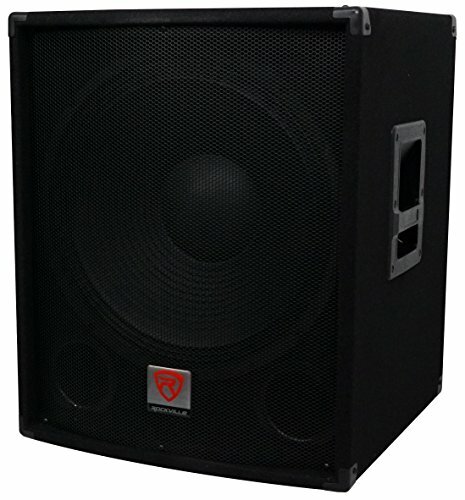 Rockville SBG1184 18" 1000 Watt Passive Pro DJ Subwoofer w/ MDF Cabinet and Pole Mount. 18" Pro audio woofer. 500 Watts RMS. 750 Watts Program Power Handling. 1000 Watts Peak Power Handling. 3" High temperature aluminum voice coil. 90 oz woofer magnet. Dual Ported Enclosure for Improved Bass Response. Construction: High-Density, High-Quality Non Resonant MDF, Stapled, Bonded & Braced. Ergonomic Recessed Handles. Molded Steel Grill. Aviation Grade Black Carpet. Pole Mount. Rubber Isolating Feet. Binding Post / Banana Plug Terminals (Negative/Positive). 1/4" Jack (In/Out). SpeakON (In/Out). All input/output connections are internally connected in parallel. Nominal Impedance: 4 Ohm. Sensitivity: 96dB @ 1w/1m. Frequency Response: 20Hz - 500Hz. Dimensions (W x D x H): 23" x 18" x 26". Weight: 53 lbs.